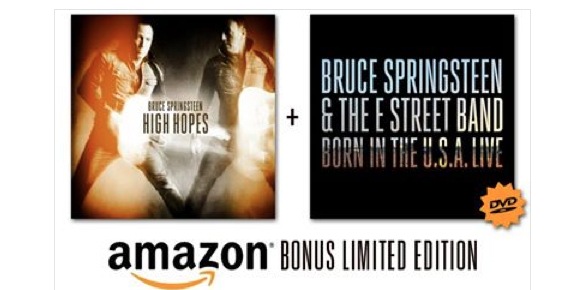 For a limited time, those who pre-order Bruce Springsteen’s new album High Hopes on Amazon will receive a bonus DVD containing a full 2013 performance of the Born In The U.S.A. album. Springsteen performed the album during a show at The Hard Rock Calling Festival in London at Queen Elizabeth Olympic Park on June 30. High Hopes is a unique studio album for Springsteen, who says it contains “some of our best unreleased material from the past decade.” Three tracks — “Just Like Fire Would,” “Dream Baby Dream” and the title song — are covers. Guitarist Tom Morello guests on eight tracks, and some of the recordings feature late band members Danny Federici and Clarence Clemons. You can read Springsteen’s liner notes for the album here.